While driving past the WSU Arboretum today, I noticed a small 2-3 inch diameter aspen (Populus tremuloides) toppled over on the ground on the banks of our small Airport Creek that runs through the arboretum. In a split second, the thought flashed in my head – you don’t suppose it could be the work of a beaver, do you? Only a few hundred feet down the road, that question was quickly answered. Of course, we’ve got beaver in the new WSU Arboretum! About 10 aspens lay freshly cut on the ground from the small clump that has been established in the riparian zone in the Arboretum. But we shouldn’t be surprised. 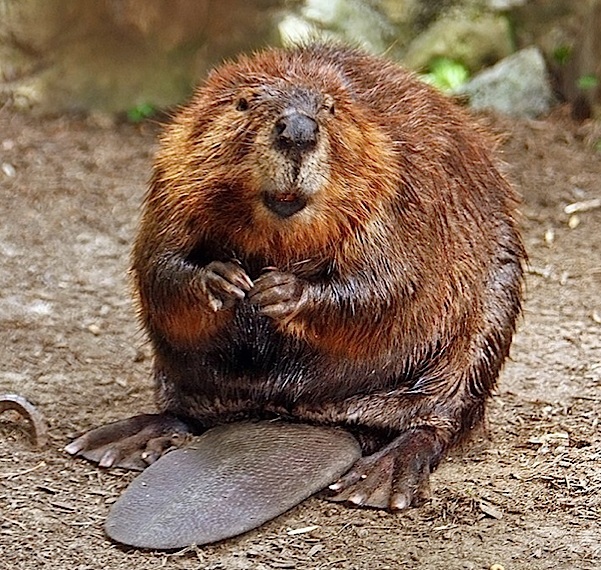 The North American Beaver (Castor canadensis) is a natural riparian zone engineer. Besides, it is spring and our relatively young aspen trees have tender greenish bark that provides good food for beavers. Our young, soft-wooded aspens that are only about 2 or 3 inches in diameter are no match for the beaver or beavers that probably came in under cover of night to cut them. My guess is that the beaver probably came down the nearby Paradise Creek from the wooded foothills of Moscow Mountain, about 8 miles to the east. Then it decided to take a little exploratory detour up our Small Airport Creek because the water is flowing briskly with spring runoff, only to discover a clump of delicious looking aspens sitting there for the taking. I don’t really begrudge beavers from doing what comes natural to them. 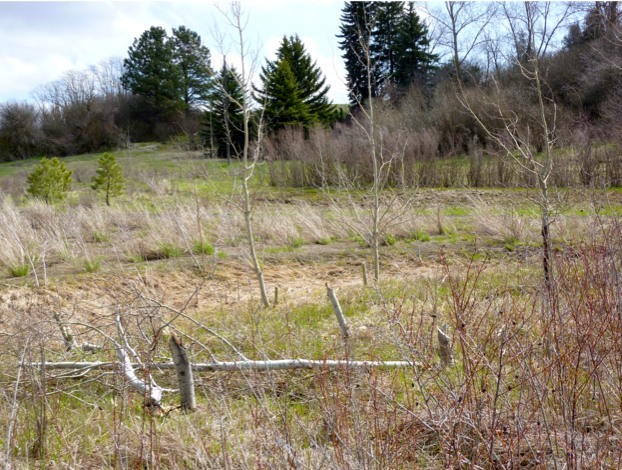 In fact, the ecology of North American forests, streams, and meadow ecosystems, as well as that of many species of wildlife, are heavily influenced by the ecological engineering of beavers. 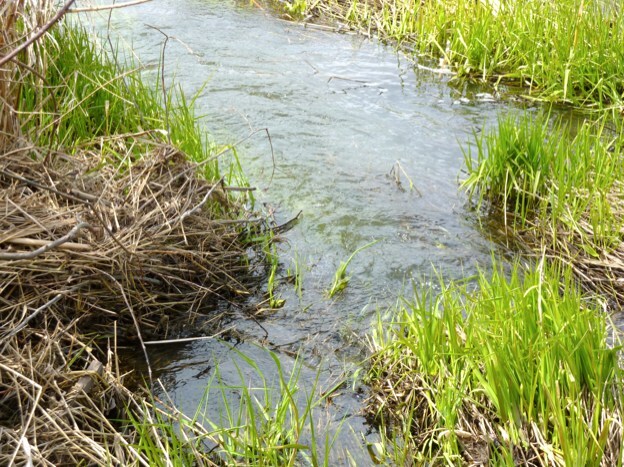 When beavers make dams on streams and creeks, they transform the riparian ecosystem by creating small to large, permanent pools of slow flowing water that become habitat for many other species. According to Dr. Marc Hayes, an amphibian biologist with the Washington Department of Fish and Wildlife, who recently gave a guest lecture to students in The Wildlife Club, beaver dams are important to the survival of overwintering Oregon spotted frogs (Rana pretiosa). Oregon spotted frogs often try to overwinter in the sticks and branches of beaver dams because the flowing water prevents freezing and assures the frogs of high oxygen content while they are under water during winter. But also important, the beaver dams provide protective shelter from predators, such as the American mink (Neovison vison), that are major predators for frogs. 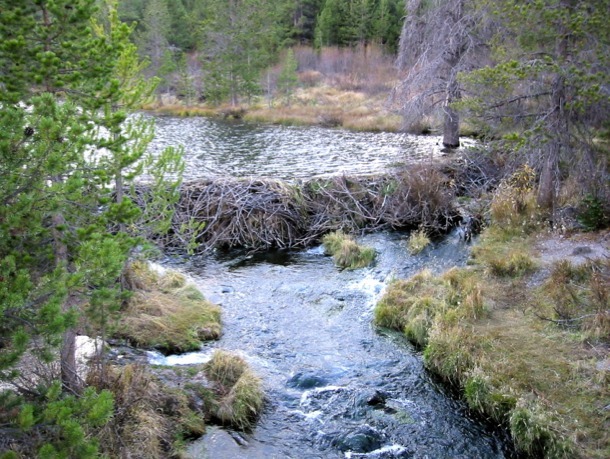 The sheltering branches and sticks of beaver dams prevent the mink from getting to the frogs when they are in a dormant state under water in winter. However, we won’t end up with a beaver dam on our little Airport Creek, if nothing else, because our riparian area and the number of aspen trees are far too small to support a family of beaver throughout the year. In fact, we’re going to have to rush out to the arboretum very soon and try to put protective barriers around our few remaining aspen to keep the beavers from clearing out our entire patch of trees. 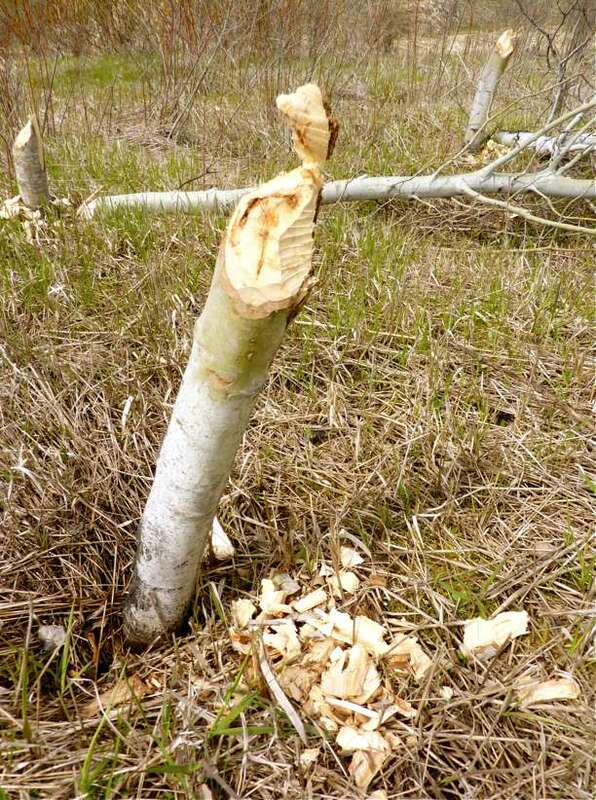 Will the aspen trees that have been cut by the beavers be killed? Not likely. Aspen trees are well adapted to beavers. When the aspens are cut by the strong, sharp teeth of beavers, they will likely just re-sprout and send up new shoots somewhere along their root system. And depending on available moisture, within only perhaps 3-4 years, you may not even know that the trees have been cut. The new stems will be as large as those that were just toppled. I think that the subject of streams, riparian systems, and engineering by American beavers is probably worth a lecture in ecology here some time at Nature @ WSU. But that lecture may have to wait, because we’ve got to rush out and try to save our few remaining aspen trees!